In Marsha Swantz' view, the most common misconception associated with dementia and other mental impairments is that the afflicted are "losing their mind." To her, even for those saddled with the most severe cases, personhood still lurks beneath. "You don't lose your mind. You're still a person. You still have feelings. You still can engage and you still have spirituality. They're still alive and breathing," Swantz said. "Maybe they can't communicate verbally with you, but they can communicate through body movements and hand movements." And Memory Café helps those with dementia continue to enjoy the human experience. After moving to a new location this summer, Memory Café — social groups for those with memory loss — is planning to hold a conference for citizens to learn about dementia and other mental impairments from experts in the field. The event will take place at 8:30 a.m. on Feb. 24 at St. Luke Lutheran Church (4595 S.W. California St,) in Southwest Portland. To register, call 503-246-2325. Marian O. Hodges, regional medical director of geriatrics for Providence Senior Health, and Annie P. Hill, author of "Unforgettable Journey: Tips to Survive Your Parent's Alzheimer's Disease," will lead the conference. Hill and Hodges have also written a book series called "Help is Here." The books will be available for sale at the conference, and proceeds will go toward a foundation to fund dementia education for family caregivers and primary care providers. The conference will also include nonprofit and for-profit vendor tables featuring organizations related to health care. Swantz says the conference is designed to help caregivers gain insight and, in turn, provide higher quality care. "The problem isn't going to go away. It's only going to get worse. The focus is on caregiving with dementia but it isn't limited to that. Any caregiver can come and more than likely benefit," Swantz said. Swantz says that while the Laughing Planet location provided publicity, Memory Cafe's new home at St. Luke's Church Fellowship Hall allows for a more expansive experience. "A Memory Café offers opportunities for socialization to persons with memory loss and their family care partners and friends. 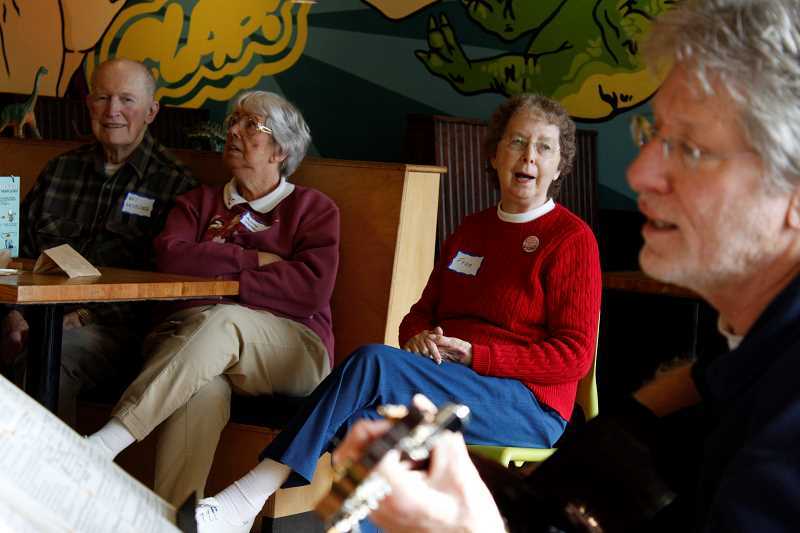 Each monthly gathering includes conversation, refreshments and sing-along music that can be enjoyed by both caregiver and care receiver," Swantz said. Pianists, guitarists and other musicians have performed at Memory Cafés and provided attendees with enjoyable auditory experiences. "We find with people with mental impairments that they very much engage with music, can recall music from the past and also like being around children and animals," Swantz said. Despite its location in a church, Memory Café is open to non-churchgoers. An average of 12-to-25 people show up every week. Because people with dimentia sometimes struggle in the afternoons, Memory Café is held from 2:30-4 p.m. on the second Thursday of every month. "My mom would get ready for bed at 2 p.m. and then be up all night because she was in bed too early," Swantz said. "I like to get people out and about and engaged in the afternoon."